Focus is expanding from just chips to include emerging challenges that span entire systems. This year I am honored to have been selected to serve as the 56th DAC Technical Program Committee (TPC) chair for the Research Track. And I am excited to announce that we are off to a great start assembling over two hundred respected researchers from both academia and industry to participate on this year’s TPC. The need for such a large TPC is driven by a recent increase in automation research to address growing design complexity and is reflected in the figure below. 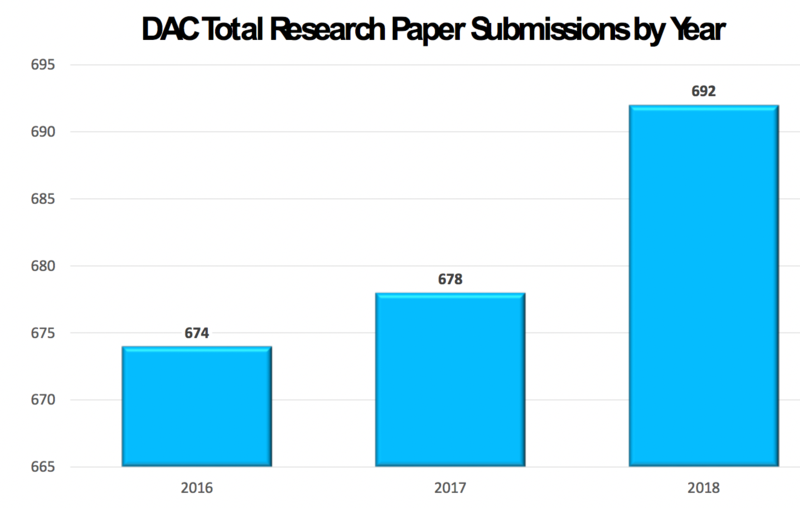 The graph shows that in 2018, DAC approved a total of 692 submissions for review, of which 168 were accepted by the TPC, resulting in an acceptance rate of 24.3%. What’s driving this increase in research? 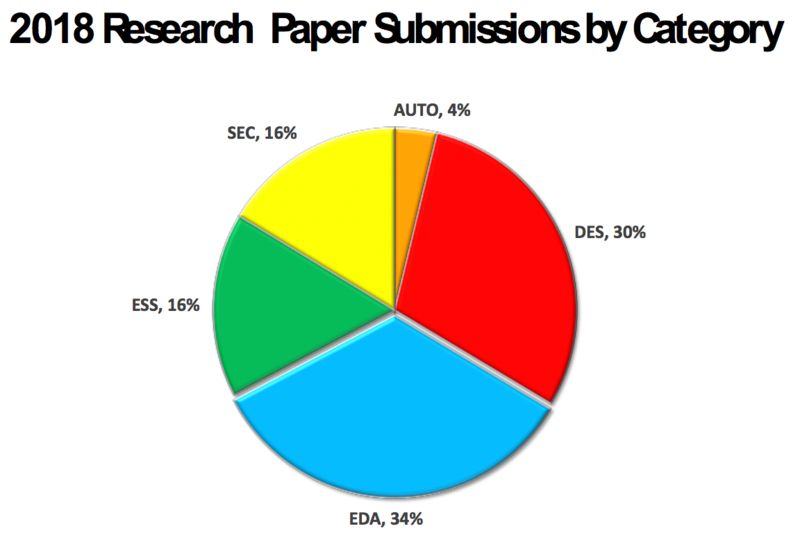 While DAC’s key research focus has traditionally been in pure EDA, which still accounts for the largest percentage of paper submissions (as shown in the figure below), DAC has evolved over the years to address emerging challenges ranging from chips to systems. This includes research in design (DES), security (SED), embedded systems (ESS), and autonomous systems (AUTO). For example, the design topic area in the research track includes the design of cyber-physical systems, SoC architectures, machine learning and artificial intelligence architectures, emerging models of computation such as brain-inspired and quantum computing, digital and analog circuits, and emerging device technologies. Whereas the security topic area focuses on research to address an urgent need to create, analyze, evaluate, and implement embedded systems and software base of the contemporary security solutions. Finally, the Embedded and Autonomous Systems topic area offers cutting-edge research to address an increasingly diverse, disruptive, and challenging field for designs ranging from mobile devices, medical devices, automotive, robotics, drones, industrial, and beyond. DAC is recognized as the premier conference for design and automation of electronic systems, and research is certainly an integral part of DAC. The call for contributions is now open, and we are off to a great start. Be sure to mark your calendars for June 2-6 at the Las Vegas Convention Center for what I am convinced will be one of the most exciting DAC years in terms of outstanding education, training, exhibits, and superb networking opportunities for both researchers and engineers.